Glide slowly up to 450 feet. Brighton is home to the world’s first vertical cable car. Until 24 July: Timeslots every 30 min. 12.30pm, 1.30pm 2.30pm, 3.30pm, 4.30pm, 5.30pm0 minutes. The Flight will last for 30 minutes. Ascend to 450 feet in the air, with an exciting ride on the world’s first ever vertical cable car. Situated on Brighton seafront, the British Airways i360 is a brand new creation from the people who gave us The London Eye. Instantly becoming an iconic feature of the Brighton skyline, the i360 is the world’s tallest moving observation tower, providing breathtaking views of the coastline, the city and 26 miles of the gorgeous surrounding area. As you slowly rise to the full height of the observation deck, the unique beauty of Brighton will spread out before you. The fully enclosed, heated, air-conditioned, aerodynamically shaped and futuristic glass viewing pod provides uninterrupted, 360 degree views that will take your breath away. 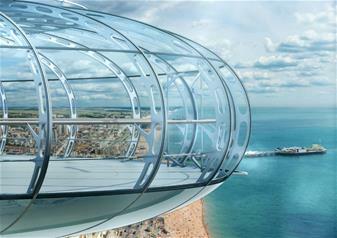 The i360 hosts a Sky Bar and the beach building at the base of the tower contains a stylish brasserie, tea rooms. It’s an amazing addition to a brilliant day out in Brighton. The ride takes 30 minutes in total and the whole experience will be around 1 hour long. This activity is disabled friendly. Please arrive 30 minutes before flight time. British Airways i360 is situated on the former site of the historic West Pier on Brighton Beach, BN1 2LN.